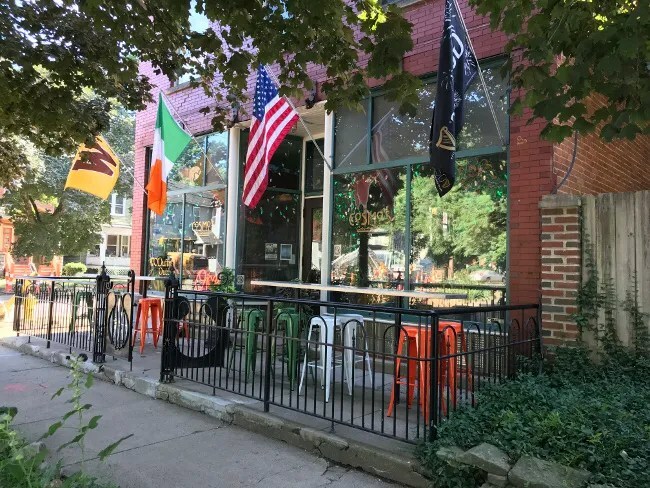 It’s been a while since I’ve written a blog post about a place in Kalamazoo. We’ve been traveling on weekends this summer and when we’re home, we’ve been trying to save money and not eat out. J has been doing this thing on Monday nights where she gets together with a group of friends who also have husbands that work second shift. They do a potluck and let the kids play. B is doing a dance class on Monday nights for a few weeks so this week, they pushed it back to Tuesday. I don’t work second shift on Tuesday so J told me I would probably want to grab something to eat before coming home as there would still be a lot of kids running around and mostly “healthy food” from their potluck. I probably could have found something to eat but I decided to take advantage of her telling me to get a beer and something to eat after work. 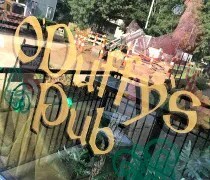 I picked O’Duffy’s Pub in the Vine Neighborhood. I’ve always heard they have great burgers but their pub menu is pretty much only burgers so I’ve never asked J to go. O’Duffy’s Pub and Cosmo’s Cucina share the same 19th century building on the corner of Vine and Locust Streets. There’s a little construction in the area right but the building is still accessible from both streets at night. Parking is on the street in the surrounding neighborhood. Trees cover the front of the building and I actually drove right past it at first. I knew it was there but it wasn’t until I was the past the building that I realized where I was. 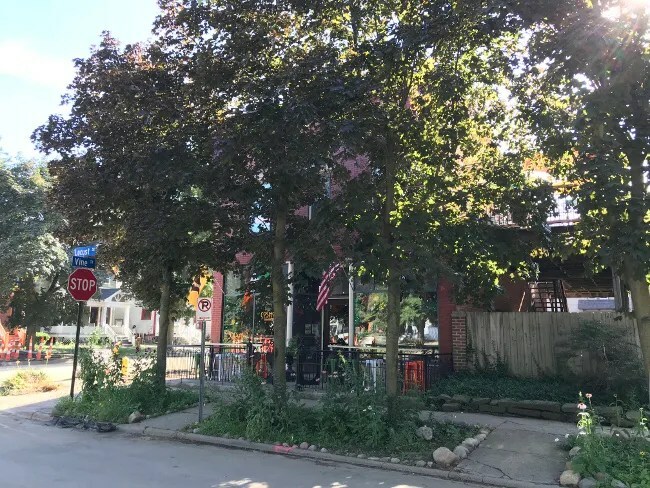 When you get past the tree cover, you can the beauty that is this old building in one of Kalamazoo’s older neighborhoods. 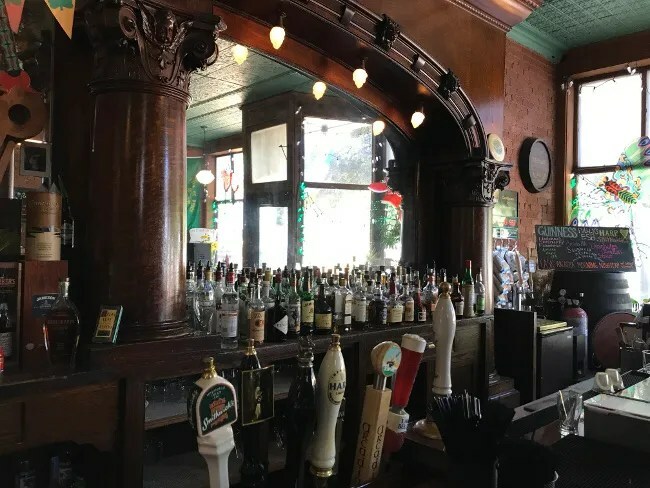 We talk to so much about neighborhood pubs and how cool they are. This is one truly is a neighborhood pub. It’s right in the middle of dense residential district and blends in with the it’s surroundings. 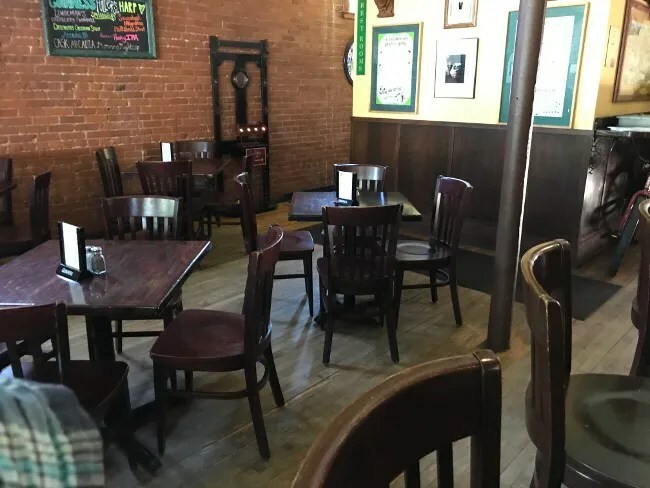 O’Duffy’s has been around since 1999 when the owner’s of Cosmo’s Cucina wanted to add a liquor license but couldn’t because the restaurant has handicap accessibility issues. J and I have eaten at Cosmo’s a couple of times. The first time we had a really great meal out on the deck. The second time we tried, it was a train wreck. I didn’t blog about it because I left so pissed that I didn’t think it would be fair. We haven’t been back since and it’s another thing that has kind of kept me away from O’Duffy’s on nights that I was on my own for dinner, but it’s also something I should have gotten over long ago. The pub was pretty empty when I walked in at 6:30 on Tuesday night. It was just me and one other couple for a while. Eventually, a band came in and started setting up for the night’s entertainment. The first thing you’ll notice about O’Duffy’s is the incredible, hand carved bar back. They picked it up from a salvage company in Kalamazoo and assume it’s dated to the turn of the 20th century. The dining room area is simple. The space takes advantage of the historic building by showing off the hardwood floors and brick walls with a stamped tin ceiling. The furniture is made up of dark, solid wood tables and chairs that fill in the space. I took a seat at the bar since it was just me. They have a small draft list on a chalkboard in the corner. Most of the beers are Irish but they have some local crafts too. I asked for the Morning Nightcap by Arcadia Ales. This was the Salted Caramel variant and it was on the cask. The bartender gave me a taste first to make sure I liked it. 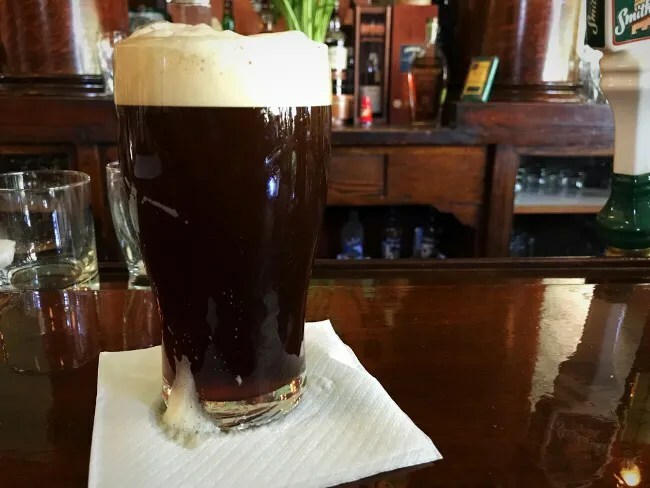 He said it was a little sweeter than the normal Morning Nightcap and it’s served warmer as it comes from the cask. It was a little bit sweet and a little bit bitter which I thought made the beer even better than normal. I had him pull me a full pint while I looked over the menu. The pub menu is almost exclusively hamburgers but the Cosmo’s menu is also available downstairs. My one complaint from our first visit to Cosmo’s was that I couldn’t order from the pub menu but in the pub, I could order from Cosmo’s. 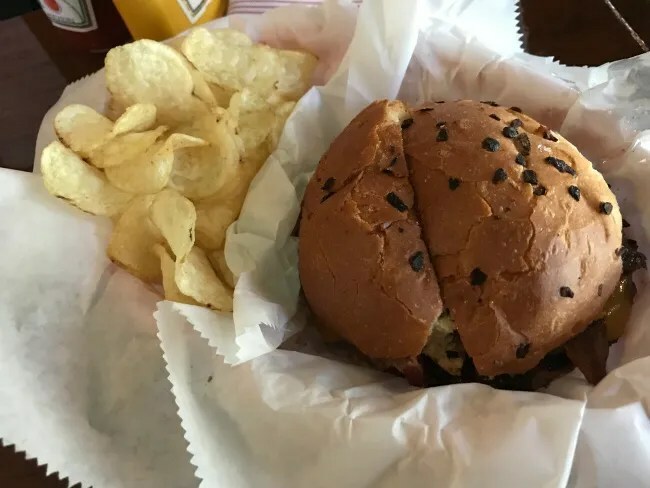 It’s a minor complaint and I still enjoyed what I had upstairs but I was excited to try these burgers that I have heard about for so many years. I ordered the Bacon Cheddar Burger and chips. The burger is simple. It’s a thick, juicy patty with thick, crispy bacon and cheddar cheese on an onion roll. 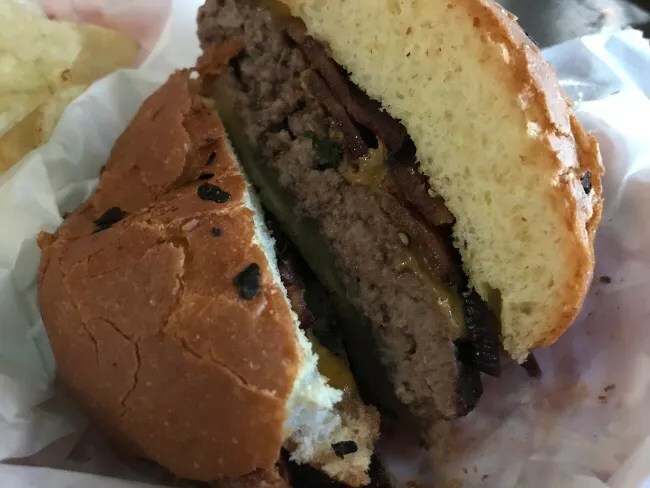 The burger is delicious at the core of what makes a good burger…..the meat. The burger patty is thick, juicy, and loosely packed. The bacon on top is a very thick cut bacon and it was cooked crispy. The rest of the sandwich just accentuated the flavors. Not being an onion fan, I could have went for a different bun, but this was one soft and held up to juiciness of the meat. The side choices were chips or carrots. I picked chips. My bill for the beer and burger was a little over $18. O’Duffy’s Pub is an awesome neighborhood pub. 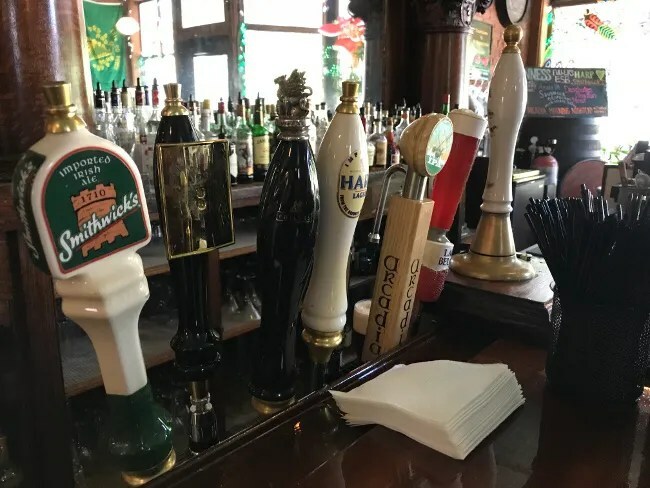 It’s the kind of place you walk to to have a beer with your friends after work with the added bonus of delicious food and a small, yet solid beer selection.